Aortitis is literally inflammation of the aorta, and it is representative of a cluster of large-vessel diseases that have various or unknown etiologies. While inflammation can occur in response to any injury, including trauma, the most common known causes are infections or connective tissue disorders. Infections can trigger a noninfectious vasculitis by generating immune complexes or by cross-reactivity. The etiology is important because immunosuppressive therapy, the main treatment for vasculitis, could aggravate an active infectious process. Inflammation of the aorta can cause aortic dilation, resulting in aortic insufficiency. Also, it can cause fibrous thickening and ostial stenosis of major branches, resulting in reduced or absent pulses, low blood pressure in the arms, possibly with central hypertension due to renal artery stenosis. Depending on what other vessels are involved, ocular disturbances, neurological deficits, claudication, and other manifestations of vascular impairment may accompany this disorder. See the image below. Presence of associated morbidity in Takayasu arteritis in the United States (adapted from combined reports by Maksimowicz-McKinnon et al and Kerr). Agents known to infect the aorta include Neisseria (eg, gonorrhea), tuberculosis, Rickettsia (eg, Rocky Mountain spotted fever) species, spirochetes (eg, syphilis), fungi (eg, aspergillosis, mucormycosis), and viruses (eg, herpes, varicella-zoster, hepatitis B, hepatitis C). Immune disorders affecting the aorta include Takayasu arteritis, giant cell arteritis, polyarteritis nodosa, Behcet disease, Cogan syndrome, sarcoidosis, spondyloarthropathy, serum sickness, cryoglobulinemia, systemic lupus erythematosus (SLE), rheumatoid arthritis, Henoch-Schönlein purpura, and postinfectious or drug-induced immune complex disease. Also, anti-neutrophil cytoplasmic autoantibody (ANCA) can affect the large vessels, as in Wegener granulomatosis, polyangiitis, and Churg-Strauss syndrome. Other antibodies such as anti-glomerular basement membrane (ie, Goodpasture syndrome) and anti-endothelial (ie, Kawasaki disease) also can be culprits. Transplant rejection, inflammatory bowel diseases, and paraneoplastic vasculitis also may afflict the large vessels. The cause or causes of giant cell or temporal arteritis, Takayasu arteritis, and polyarteritis nodosa are unknown. The disease has 3 phases. Phase I is the prepulseless inflammatory period characterized by nonspecific systemic symptoms including low-grade fever, fatigue, arthralgia, and weight loss. Phase II involves vascular inflammation associated with pain (eg, carotidynia) and tenderness over the arteries. Phase III is the fibrosis stage, with predominant ischemic symptoms and signs secondary to dilation, narrowing, or occlusion of the proximal or distal branches of the aorta. Bruits frequently are heard, especially over carotid arteries and the abdominal aorta. The extremities become cool, and pain develops with use (ie, arm or leg claudication). Even in phase III, a significant number of patients seem to have insidious vascular inflammation, which has been demonstrated in surgical specimens and postmortem series. In advanced cases, occlusion of the vessels to the extremities may result in ischemic ulcerations or gangrene, and with the involvement of cerebral arteries, strokes can occur. Because of the chronic nature of the disease, however, collateral circulation usually develops in the areas involved by vasculitis. Pathologic changes involved in Takayasu arteritis are the same as for giant cell arteritis. Involved vessel walls develop irregular thickening and intimal wrinkling. Early in the disease, mononuclear infiltration with perivascular cuffing is seen. That extends to the media, followed by granulomatous changes and patches of necrosis and scarring (fibrosis) of all layers, especially the intima. Late stages have lymphocytic infiltration. 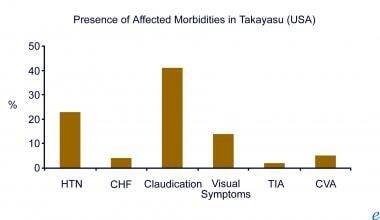 The distinction between Takayasu and giant cell arteritis is primarily the clinical pattern of vessels involved. Giant cell arteritis commonly involves the temporal artery, whereas Takayasu arteritis primarily involves the aorta, its main branches, and, in 50% of cases, the pulmonary artery. The initial vascular lesions frequently occur in or at the origin of the left subclavian artery, which can cause weakened radial pulse and easy fatigability in the left arm. As the disease progresses, the left common carotid, vertebral, brachiocephalic, right-middle or proximal subclavian, right carotid, and vertebral arteries, as well as the aorta, also are affected, as well as retinal vessels. 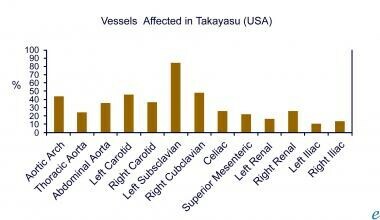 The image below illustrates the frequency of vascular involvement in Takayasu in patients in the United States. Frequency of vascular involvement (adapted from combined reports by Maksimowicz-McKinnon et al and Kerr). When the abdominal aorta and its branches, eg, the renal arteries, are involved, central hypertension may develop. Accurate blood pressure measurement may be difficult because of arterial lesions affecting supply to the extremities. Varying degrees of narrowing and occlusion or dilation of involved portions of the arteries result in a wide variety of symptoms. In the United States and Europe, incidence is 1-3 new cases per year per million population. In a cohort of 1204 surgical aortic specimens described by Rojo-Leyva et al  , 168 (14%) had inflammation and 52 (4.3%) were classified as having idiopathic aortitis. Among 383 individuals with thoracic aortic aneurysms, 12% had idiopathic aortitis. Vasculitis has a worldwide distribution, with the greatest prevalence among Asians. An extensive epidemiological study conducted in Japan in 1984 identified 20 cases per million population. In 1990, Takayasu arteritis was added to the list of intractable diseases maintained by the Japanese Ministry of Health and Welfare; by the year 2000, 5000 patients were registered (the reported prevalence increased 2.5-fold). The 2 major predictors of poor outcome are complications (eg, Takayasu retinopathy, hypertension, aortic regurgitation, aneurysm) and progressive course. Patients with no complications or with mild to moderately severe complications have a 10-year survival rate of 100% and a 15-year survival rate of 93-96%. With notable complications or progression, the 10-year survival rate is 80-90% and the 15-year survival rate is 66-68 %. The occurrence of both a major complication and progressive course predicts the worst outcome (43% survival rate at 15 y). Vasculitis is most common among women of reproductive age (female cases outnumber male at a ratio of 9:1). Aortitis is most commonly discovered at age 10-40 years. [Guideline] Erbel R, Aboyans V, Boileau C, for the Task Force for the Diagnosis and Treatment of Aortic Diseases of the European Society of Cardiology (ESC). 2014 ESC Guidelines on the diagnosis and treatment of aortic diseases: document covering acute and chronic aortic diseases of the thoracic and abdominal aorta of the adult. Eur Heart J. 2014 Nov 1. 35(41):2873-926. [Medline]. Miller DV, Maleszewski JJ. The pathology of large-vessel vasculitides. Clin Exp Rheumatol. 2011 Jan-Feb. 29(1 Suppl 64):S92-8. [Medline]. Rojo-Leyva F, Ratliff NB, Cosgrove DM. Study of 52 patients with idiopathic aortitis from a cohort of 1,204 surgical cases. Arthritis Rheum. 2000 Apr. 43(4):901-7. [Medline]. Vanoli M, Daina E, Salvarani C, Sabbadini MG, Rossi C, Bacchiani G. Takayasu's arteritis: A study of 104 Italian patients. Arthritis Rheum. 2005 Feb 15. 53(1):100-7. [Medline]. Hall S, Barr W, Lie JT. Takayasu arteritis. A study of 32 North American patients. Medicine (Baltimore). 1985 Mar. 64(2):89-99. [Medline]. Loricera J, Blanco R, Hernandez JL, Carril JM, et al. Non-infectious aortitis: a report of 32 cases from a single tertiary centre in a 4-year period and literature review. Clin Exp Rheumatol. 2014 Dec 1. [Medline]. Eichhorn J, Sima D, Thiele B. Anti-endothelial cell antibodies in Takayasu arteritis. Circulation. 1996 Nov 15. 94(10):2396-401. [Medline]. Chauhan SK, Tripathy NK, Nityanand S. Antigenic targets and pathogenicity of anti-aortic endothelial cell antibodies in Takayasu arteritis. Arthritis Rheum. 2006 Jul. 54(7):2326-33. [Medline]. Matsuyama A, Sakai N, Ishigami M. Matrix metalloproteinases as novel disease markers in Takayasu arteritis. Circulation. 2003 Sep 23. 108(12):1469-73. [Medline]. Hartlage GR, Palios J, Barron BJ, Stillman AE, Bossone E, Clements SD, et al. Multimodality imaging of aortitis. JACC Cardiovasc Imaging. 2014 Jun. 7(6):605-19. [Medline]. Balink H, Spoorenberg A, Houtman PM, Brandenburg A, Verberne HJ. Early recognition of aortitis of the aorta ascendens with (18)F-FDG PET/CT: syphilitic?. Clin Rheumatol. 2013 Feb 2. [Medline]. Rahman MS, Storrar N, Anderson LJ. FDG-PET/CT in the diagnosis of aortitis in fever of unknown origin with severe aortic incompetence. Heart. 2013 Mar. 99(6):435-6. [Medline]. Baer AN, Gourin CG, Westra WH, Cox DP, Greenspan JS, Daniels TE. Rare diagnosis of IgG4-related systemic disease by lip biopsy in an international Sjögren syndrome registry. Oral Surg Oral Med Oral Pathol Oral Radiol. 2013 Mar. 115(3):e34-9. [Medline]. [Full Text]. Martínez-Rodriguez I, Martinez-Amador N, Banzo I, et al. Assessment of aortitis by semiquantitative analysis of 180-min (18)F-FDG PET/CT acquisition images. Eur J Nucl Med Mol Imaging. 2014 Dec. 41(12):2319-24. [Medline]. Yamada I, Nakagawa T, Himeno Y. Takayasu arteritis: evaluation of the thoracic aorta with CT angiography. Radiology. 1998 Oct. 209(1):103-9. [Medline]. Johnston SL, Lock RJ, Gompels MM. Takayasu arteritis: a review. J Clin Pathol. 2002 Jul. 55(7):481-6. [Medline]. [Full Text]. Andrews J, Al-Nahhas A, Pennell DJ. Non-invasive imaging in the diagnosis and management of Takayasu's arteritis. Ann Rheum Dis. 2004 Aug. 63(8):995-1000. [Medline]. Meller J, Strutz F, Siefker U. Early diagnosis and follow-up of aortitis with [(18)F]FDG PET and MRI. Eur J Nucl Med Mol Imaging. 2003 May. 30(5):730-6. [Medline]. Blockmans D. PET in vasculitis. Ann N Y Acad Sci. 2011 Jun. 1228:64-70. [Medline]. [Guideline] Kalva SP, Dill KE, Bandyk DF, Francois CJ, Gerhard-Herman MD, Hanley M, et al. ACR Appropriateness Criteria® Nontraumatic Aortic Disease. J Thorac Imaging. 2014 Sep. 29(5):W85-8. [Medline]. Hoffman GS, Leavitt RY, Kerr GS. Treatment of glucocorticoid-resistant or relapsing Takayasu arteritis with methotrexate. Arthritis Rheum. 1994 Apr. 37(4):578-82. [Medline]. Daina E, Schieppati A, Remuzzi G. Mycophenolate mofetil for the treatment of Takayasu arteritis: report of three cases. Ann Intern Med. 1999 Mar 2. 130(5):422-6. [Medline]. Hoffman GS, Merkel PA, Brasington RD. Anti-tumor necrosis factor therapy in patients with difficult to treat Takayasu arteritis. Arthritis Rheum. 2004 Jul. 50(7):2296-304. [Medline]. Nuenninghoff DM, Hunder GG, Christianson TJ, McClelland RL, Matteson EL. Incidence and predictors of large-artery complication (aortic aneurysm, aortic dissection, and/or large-artery stenosis) in patients with giant cell arteritis: a population-based study over 50 years. Arthritis Rheum. 2003 Dec. 48(12):3522-31. [Medline]. Matsuyama A, Sakai N, Ishigami M, Hiraoka H, Yamashita S. Minocycline for the treatment of Takayasu arteritis. Ann Intern Med. 2005 Sep 6. 143(5):394-5. [Medline]. Unizony S, Stone JH, Stone JR. New treatment strategies in large-vessel vasculitis. Curr Opin Rheumatol. 2013 Jan. 25(1):3-9. [Medline]. Liang P, Tan-Ong M, Hoffman GS. Takayasu's arteritis: vascular interventions and outcomes. J Rheumatol. 2004 Jan. 31(1):102-6. [Medline]. Diffuse stenosis from the aortic arch to the abdominal aorta. The left common carotid artery are also stenotic and the left subclavian artery is not visualized. Dilatation of the bilateral vertebral arteries. Occlusion of the right internal carotid artery. Severe stenosis of the left internal carotid artery. Moderate stenosis of the left external carotid artery at the bifurcation with dilated collateral circulation. Moderate stenosis of the external iliac artery at the bifurcation and occlusion of the right femoral artery. Leukocyte infiltration of the vasa vasorum of the aorta accompanies arteritis obliterans and ischemic necrosis of the media in a case of syphilitic aortitis. Granulomatous arteritis with thrombosis of a cerebral vessel may present as a neurological defect with no obvious vascular disease by history or physical.